The Puberty Study reached final enrollment of 321 participants. We retained 85% of families through year two of assessments and about 70% of families have returned for year 3 assessments. There are about 10% of families that have yet to complete year three assessments. The primary reason for conducting the Puberty Study was to determine whether the stress system, first trained under the conditions of orphanage/institutional rearing, would recalibrate its functioning around puberty now that the child was living in supportive, well-resourced homes. We examined this by looking at morning cortisol levels, which so far have not shown evidence of pubertal recalibration with late adopted children showing more blunted morning levels of cortisol, and with children’s cortisol stress hormone responses to a public speaking and arithmetic task. We have now examined the children’s responses to the public speaking task the first time they did it. As seen in Figure 2, our results showed us, as we expected, that children adopted internationally from orphanages show a blunted cortisol stress response if they are earlier in pubertal development. This is consistent with our evidence in previous studies and evidence collected by colleagues studying children in Romanian orphanages. Studies of children experiencing trauma have also shown this type of blunting of physiological stress reactivity. Notably, however, for children adopted internationally from orphanages who were screened as in later stages of pubertal development, we saw no difference in cortisol stress response to the public speaking task. 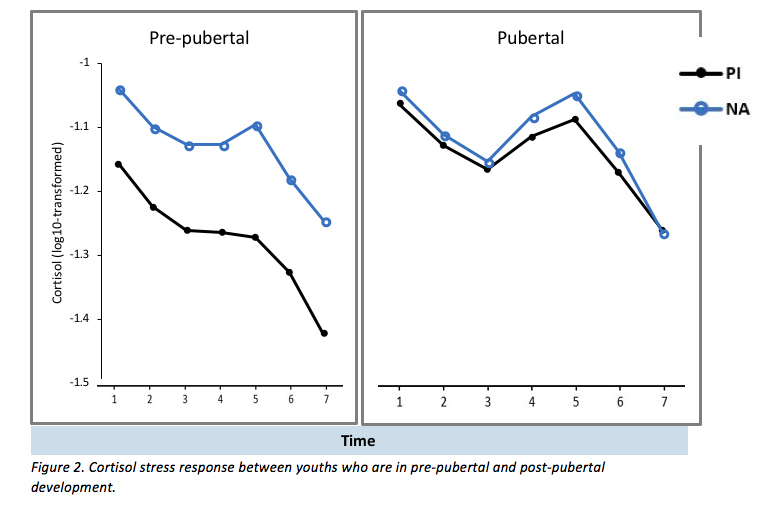 This was our prediction and the reason for the study, thus it was gratifying to see that puberty may open up a window for “normalizing” the stress system. Of course, we need to verify this by seeing whether we can examine the same children as they move through pubertal development to know if we can see the same shift in stress functioning. Stay tuned. The ability to regulate negative emotions is a critical skill. Children who are unable to regulate anger and frustration are more likely to lack behavioral control and engage in aggression and defiance. Ineffective regulation of fear and anxiety can often lead to rumination over the source of distress or the suppression of negative affect, both underlying anxiety and depression. The inability to down-regulate negative emotions also makes engaging in socially appropriate interactions with peers and teachers more difficult and it hinders children’s ability to engage with increasingly challenging academic and social tasks that occur as children progress through the school context. Children who have experienced early adversity have been found to struggle in school, have difficulty with friends, and display more behavior problems. Thus, problems in emotion regulation have been described as possibly underlying many of their difficulties. Emotion regulation develops most rapidly in the first few years of life. A responsive and supportive caregiving environment plays a key role in the development of emotion regulation such that through repeated interactions, emotion regulation skills that were once facilitated by caregiver support are thought to become engrained in the child’s own self-regulatory skillset. Experiencing adversity early in life in the form of institutionalized care may contribute to deficits in emotion regulation later in life. In the Puberty Study, we hypothesized that children and adolescents who were internationally adopted after being in institutional care would have fewer emotion regulation skills during a social stress test than their non-adopted peers. Further, we were interested in the physiological cost of regulation. We hypothesized that a cortisol response to social stress may be helpful but a biologically expensive tool for regulation. Finally, we tested whether emotion regulation skills were associated with academic, behavioral, and social adjustment in the same way for children experiencing early life adversity and their non-adopted peers. In this study, children completed the speech portion of the Trier Social Stress Test (TSST). Trained research staff watched videos of the children’s speech and rated the extent to which they were able to regulate their anxiety and engage in the speech. Cortisol was collected at intervals before and after the speech to assess cortisol reactivity to social stress, and parents reported on children’s adjustment. Results indicated that at younger ages, children who experienced early institutional care did not differ from non-adopted children in their emotion regulation abilities. However, by age 13, children who experienced early life adversity were on average observed to struggle more with regulating their emotions than their non-adopted peers. That is, their skills during the speech did not increase with age as much as those of their non-adopted peers. This suggests that all children show increasing emotion regulation skills with development, but children experiencing early adversity may lag behind, resulting in an increasing gap in emotion regulation at later ages. We also found that greater emotion regulation skills were associated with an increased cortisol response during the speech for children experiencing early adverse care, while greater emotion regulation was associated with a lower cortisol response for non-adopted children. Thus, when children who experienced early institutional care are able to regulate despite their anxiety, it may come at a higher physiological cost. We also examined the relations between regulating emotion during our speech task and children’s emotional and behavioral problems according to parents. Here wound no association for the non-adopted comparison children, but a significant association for the adopted children. Specifically, for them being able to regulate despite anxiety was associated with few parent-reported behavior problems. In conclusion, we may foster the development of children who have had adverse early life histories by helping those who struggle to control their behavior and anxiety to better regulate their emotions; this may be particularly important during adolescence, a time of increasing social and academic challenges, if children who experienced early institutional care start to fall behind their non-adopted peers. We should also recognize, however, that controlling and regulating their emotions may tax them more biologically than children who have not experienced early adversity. We want to express our appreciation to the children and their families for the opportunity to be part of their dedicated participation in the important research of pubertal development at the University of Minnesota these past 4 years. What a privilege it has been to be part of your journey of great change and experience the courage, commitment, and contributions of time and trust in this study that will have meaningful and positive impact for children in the future. Wishing you all the very best – Jan Goodwalt, RN, Terri Jones, RN, Melissa Stoll, RN.